Before Philip answered the call to go Home, he spent much time in several well-known passages, Psalm 23 and 24, which were the source of manna and meditation that produced his last written work, “The Day in the Life of a Sheep.” The Christian Witness Ministries Fellowship (CWMF) Thursday Night Home Fellowship, worked tirelessly in the days before the funeral to print Philip’s last Blogs into a booklet which was then made available on the day we celebrated together, Philip’s trust in the Great Shepherd. 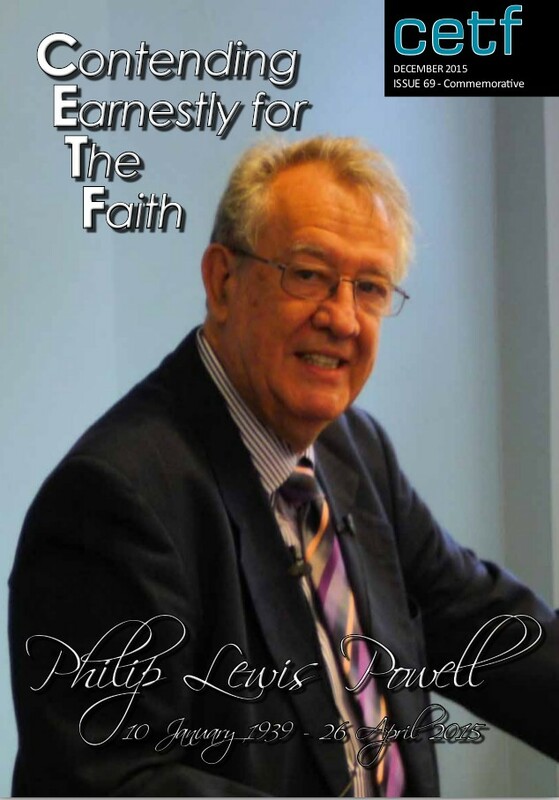 We have tried to include this work in this Commemorative Edition of Contending Earnestly for the Faith (CETF) as a Tribute to the Pioneer of Christian Witness Ministries. I would like to turn your attention to The Gospel of John, Chapter 21 verses 15 -17, for a few moments. “Do you love ME more than these? Feed My LambsTend my Sheep,Feed My sheep. What was Jesus asking Peter? Do you love me more than these, your friends? Do you love me more than the Boats & Nets... or that which you know and are skilled in? Are you willing to give all and devote your life to the Gospel? In all these three ways, Philip Powell demonstrated his commitment to his Saviour; In Home Life, In Public Life and in his Pulpit life. Firstly, Philip was a true Shepherd, as he lovingly cared for the weakest and most vulnerable, with tenderness and longsuffering he fed the Lambs. Secondly, in tending the sheep, Philip would defend the flock by attacking that which presented immediate and imminent danger and peril to the flock. He would be on the offensive to rightly divide the word of truth before all men, without partiality or prejudice; always with the protection of the flock as his purpose and charge and never for self-served ambition. Thirdly, in the feeding of the sheep, Philip had a unique God given ability to lead the believer to pastures of untouched beauty. His depth and insight was matched with his academic and analytical mind to rightly exegete a passage, providing the flock with stable well-watered pastures and rich bountiful food. 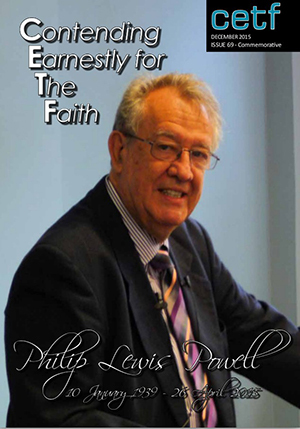 As a senior elder, Philip gave his wisdom and wealth of knowledge to spiritual matters. 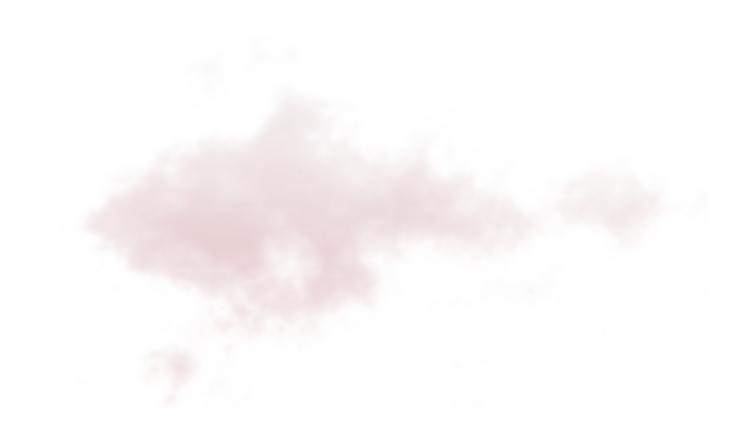 He was often slow to act, because he knew that time was a great revealer. Everything done or achieved in ministry was based on prayer, and any endeavour, whether conference organizing, travelling to preach or CETF distribution, were all a walk of faith. He was one of a kind, and we all are going to miss him immensely, but he wanted us to take up the baton and live for Jesus and His cause and in so doing, serve Him no matter the cost. 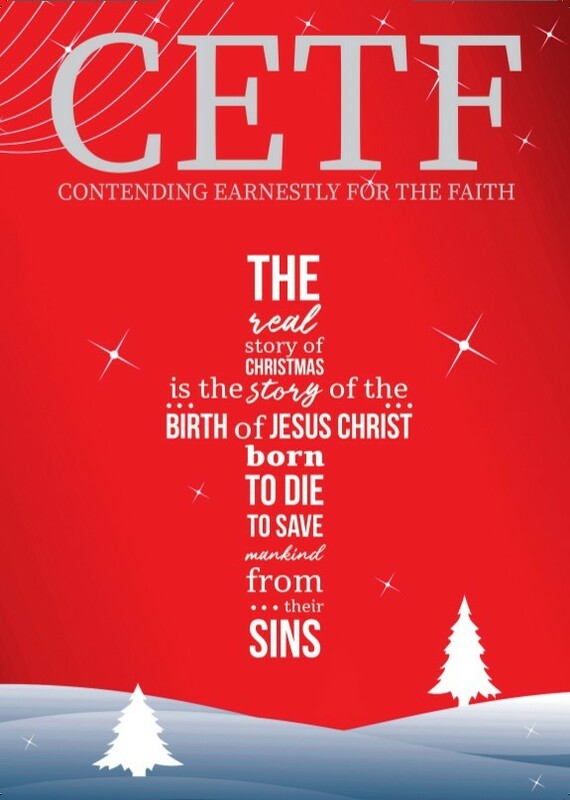 As the Lord provides, it is my desire to keep the Magazine, “Contending Earnestly for the Faith” published three times annually along with strengthening the Resource Centre, which is so ably administrated by Maureen O’Brien from Loch Sport, Victoria, as a functioning arm of CWMF. Over the past few years Brett Bigg has assisted Philip with the Editorial content of the Magazine. Brett has accepted the responsibility to continue in this capacity as Editor. Brett may draw on assistance from brothers who have provided great sound Doctrinal articles to assist him, but all will then be under the direction of the CWMF Eldership and myself. 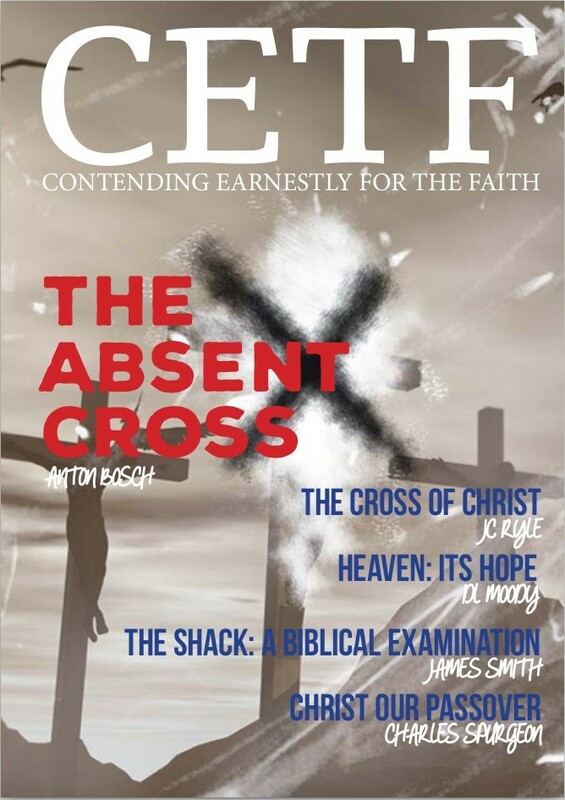 The magazine will continue to be a Faith Venture as there are still no fulltime employed positions in CWMF. We will continue to rely on your generous donations along with making use of the Resource Centre through the purchase of Books, DVD’s and Audio messages to fund the CETF Publications. 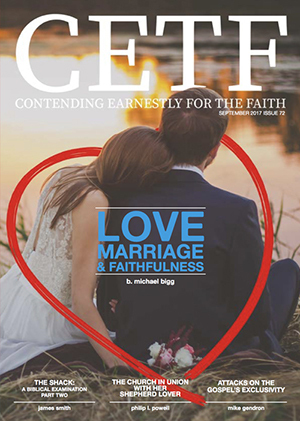 We thank the Lord for His gentle leading and guidance over the past 7 months; and your patience in allowing additional time to bring CETF#69 to print.